Only after these eight paragraphs does the story return to the subject of the headline. But the Taoiseach is going to compel Catholic hospitals to perform abortions. It’s not enough that abortion must be made legal: it must be made compulsory. A right implies an obligation, after all. It’s well and good to have the right to an abortion, but what good is possessing that right if there is no one to provide the service? If too many potential suppliers simply refuse to provide an otherwise legal service, then the new law would lose in practice what it gained in theory at the ballot box. 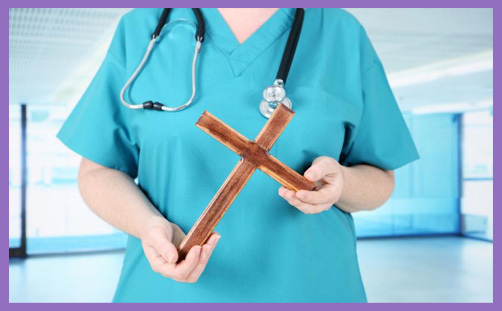 So the denizens of progressive righteousness survey the landscape and notice a disturbing reality: too many hospitals are known to be unwilling – you know, those reactionary Catholic hospitals; hospitals which must be made to conform to the New Order. A golden statue has been placed in the square. When the trumpet sounds, everyone is required to bow down and worship. There can be no exceptions. The sexual revolution demands its sacrifice in blood. But remember this: the act of granting ‘conscientious objector’ status is both an implicit claim of authority and a declaration that the objector is outside the moral norms of society. It is, by definition, an accommodation and not a right. The conscientious objector receives his or her status only because the government deigns to grant it, and it is kept only so long as the government suffers them to keep it. There is no moral imperative that protects the objector, for the government does not respect their moral position as legitimate. The government merely tolerates the ability to act upon it for the time being. Should circumstances dictate, the government can and will withdraw the status. If this poll is to be believed, there is a significant level of desire to stay out of the abortion business among Irish doctors. Certainly the repeal of the Eighth Amendment has been received with great concern regarding the implications for coercion. So if the Irish Government sees the need to make sure that abortion services are reliably available at the local level, and too many doctors fail to opt in, the Government might very well seek to coerce as a condition of employment. It’s not like the idea is unprecedented. The Irish Government has by this decision relegated religious conviction to the personal sphere. Individuals may act on conscience – for the time being. But individuals may not group themselves together into a public organisation and act upon their religious convictions as a collective. That is forbidden. The corporate act of religious freedom is restricted and hidden behind a claim that individual religious liberty is protected. But if individual religious liberty cannot be collectively organised, then it is intrinsically atomised and functionally banned from the public sphere. These Catholic hospitals simply want to operate by their own light. They compel no one. But it doesn’t matter. The trumpet has sounded. They must bow down. They must be made to bow down. There is, in fact, no logical reason why a hospital couldn’t (theoretically) be compelled to perform female circumcision under that rule. You think this crazy? Then follow along. Assume someone perfects a pre-natal method of female circumcision. Why (given the mother’s autonomous control of her pregnancy) could she not request such a procedure on her unborn child? She can have the child killed through abortion. Is death less severe than FGM? It would only take one judge to order it in the name of a woman’s autonomy. And the precedent is there. It’s not like gender specific abortions are prosecuted. “It’s the Government’s money, Doctor. Start cutting.” Oh, the rage that would be vented over such a thing. And the medical mechanics who would butcher the young would suddenly understand. Sure, sure, FGM is considered barbaric, and who can think the law would ever allow it? But then 75 years ago abortion was considered barbaric, and who then thought the law would ever allow it? It’s tough to hold against the tide when there is no anchor fixed to the sea floor. Then the Taoiseach was filled with fury, and the expression of his face was changed. He ordered the furnace heated seven times more than it was usually heated.